Why nurses don't want to talk to a ward psychologist? I have no problem talking to a therapist and have done so of my own volition when struggling with issues in the past. But I would never avail myself if one who was also a coworker. Even if I trusted that nothing would get back to management, it's just too close a working relationship to be comfortable sharing personal vulnerabilities. I want someone entirely separate from the rest of my life for that. All the members of our leadership team- basically everyone who has a desk job in our department- ends all their department-wide emails with "I appreciate you all!" They *have* to have learned it in some seminar. And it sounds hilariously inappropriate at the end of emails that are just completely neutral or worse, negative. "Please, each remember to complete two chart checks this week. And we need to stop placing unbagged dirty linen in the carts, housekeeping WILL NOT collect it. I appreciate you all!" 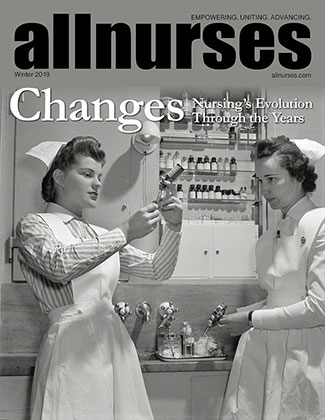 What Did You Get For Nurses Week? The opportunity to purchase a t-shirt if we wanted it lololol. My co-worker hates me for doing my job. Literally the only person I've ever seen get angry at someone wanting to watch them waste was later fired for diversion. I can imagine a way that the request could be phrased/toned to get someone's hackles up even though it's the law, but it doesn't sound like you did that, and, well, it is the law. This is *not* normal behavior and I'd keep an eagle eye on her and her record-keeping and definitely not sign anything until you see the actual waste (with her or anybody). Pay grades for different units?? Everywhere I have worked there has been no difference. There is sometimes a small differential for certifications or a BSN, but some places don't even offer that, but rather count those things as points toward a "clinical ladder" program in which you get small extra raises as you climb the ladder (in addition to typical COL/performance raises). The major advantage of a specialty is that it gives you more flexibility in where you work, and usually slightly better working conditions than med-surg. It may also open you up to travel and contract positions in which the pay is higher because the specialty is in demand. But typically no difference in pay for different units within a single employer. Many nurses work a full-time 36 hour job and a second per diem/PRN job (which can vary in hours from as few as one shift a month to one or more a week). The per diem job usually pays more/hour as it has no benefits. The reason for this is that per diem jobs are very flexible and it's possible to schedule them around your full-time job. It's essentially impossible to work two full time nursing jobs, because no full-time job is going to agree to schedule you around another full time job. You absolutely would run in to scheduling problems. It also makes no sense- most jobs have available overtime, and you would make far more working those hours somewhere where you're paid overtime than working a second job where you're somehow at 72 hours without overtime. You also probably can't and definitely shouldn't take a second job of any kind while you're still a new grad. You have a *lot* to learn in that first year, which will include didactic classes outside your work time and a lengthy orientation- take the time to learn it properly. Any job that would be willing to hire you PRN as a new grad (and there wouldn't be many) is NOT a place you should work. PRN jobs are typically intended for experienced nurses who need minimal orientation to a unit and specialty. New grads typically need and get 3-6 months of orientation before being allowed to practice independently. You can see why good employers would be reluctant to hire people who need months of orientation for a job where they might only work one shift or less a week, right? "Anesthesia nurse" is an advanced practice role that requires completing years more of highly competitive school and an additional licensing process. Travel companies do not hire new grads for the same reasons that new grads aren't hired for PRN jobs- they are looking for experienced people who can hit the ground running in an under-staffed unit. Input Needed - What brand of scrubs do you prefer? Wonderwink- I like their "origins" (basic cotton/poly) line as well as their various performance lines. Fit well, have nice pockets with interior dividers, wear well, and are cheap. I have some Cherokee Luxe and another of the fancier Cherokee lines that I can't remember because the branding marks have washed off, that are comfy but haven't worn well for the price- holes, fading, wear at the hems, and dinginess after about a year, while the Wonderwink still look basically new. Cherokee is what we're officially required to wear and is all the hospital scrubs shop sells, but nobody has ever fussed at us for other brands as long as they're royal blue. I don't mind expensive scrubs- they're certainly cheaper than business wear, and they typically last longer too. But of course I'd rather pay less for the same quality if it's possible. I loathe royal blue, but it is what it is and that's what I buy. You realize that when an ER nurse transports the patient (mandatory for ICU patients in all facilities I've worked and common for all patients, especially on night shifts and weekends), she is also leaving her 3-7+ other, frequently unstable patients for the duration? How to protect yourself from infections after work? If I step in something horrifying, I wipe down the soles of my shoes, and I wipe my phone down with alcohol wipes now and then mostly because otherwise touching it to my face seems to increase breakouts, but I agree with above comments that this ritual you're describing is both excessive, unnecessary, and likely to escalate. There is no clinical evidence that special laundry techniques change the microbial load of nursing uniforms, either. Have you talked to your doctor about treatment for your OCD? Weird how true mortgage companies don't provide mortgages for the love and gift of underwriting, though, and true grocers don't distribute food for the love of... grocing? True nurses *provide good nursing care*, period, and all of them have to eat and live the rest of the time. You don't get bonus sanctimony points and your patients don't get any better for martyring yourself. I had a PICU preceptorship (that went very well! ), one that I fought and begged for (because prior to that semester they didn't place in PICU) that I thought was the first step towards working in PICU. In the end I realized that my idealized concept of PICU was not the same as the reality. I wound up in med-surg as a new grad and ER later, which is a much better fit for my personality. And I realize too that if I had a sudden hankering to work in PICU now that I have several years of critical care experience and good performance reviews under my belt, I could probably make that happen. I haven't, though. My point is, your preceptorship, although it feels like THE BIGGEST THING IN THE WORLD while you're heading in to it, and it IS important, is ultimately just a few weeks out of years of training and career. After your first round of new grand interviews, people probably won't even ask about it/you may eventually wind up deleting it from your resume for reasons of space. It can be a stepping stone to a job, but it isn't necessarily, nor does getting one in a specific unit represent a dramatic step towards that specialty. It's JUST a few weeks. If you're passionate about NICU, you can convey that to interviewers and apply like anybody else, even without a preceptorship in one. And going in to your preceptorship with enthusiasm and an open mind will be the best way to guarantee you have a good outcome and maybe even earn a good recommendation from your preceptor, which ultimately is much more important than where you were placed. A specialty unit can TEACH a new grad their specialty- they don't expect a NICU preceptee to be more than a hair's breadth more competent in independent NICU practice than someone who has never stepped foot in one before. What they'll be most concerned about is your ability to thrive and learn even in a setting that might not be exactly what you hoped and dreamed of. Because even your dream job probably won't be exactly what you hope and dream for. I was wondering about this, too. What course would you suggest the ER take with a full code patient six hours from death? One of my (dearly beloved) instructors as a student made the comment, when someone expressed concern over feeling like she wouldn't know everything she needed to be a staff nurse, "You definitely won't. You will know enough to be educable when you begin, and you will learn the rest in your specialty." I actually took some comfort in this, and over the years I've realized how true it is, and how it's not only true of new grads- few if any nurses, even those with years of experience, know enough to thrive in every specialty without additional training and education, even if it's informal and on the job. Nursing school and licensure is there to ensure you have a base of universal knowledge- anatomy, physiology, pharmacology, pathophysiology, and nursing theory, along with a few basic tasks- things that will mean you aren't totally at loose ends when you're handed to a preceptor- you will understand their rationales as they teach you, you will be able to comprehend the whys behind the whats and hows of policies and procedures. Everything else will be- almost must be- picked up as you go. Pay attention, look things up, ask questions, don't be afraid to admit when something is new or confusing to you, and you'll be fine. Yes, I encountered this with a patient who would have her phone on under the blankets and try to goad staff in to saying something inappropriate. This was just one in an entire galaxy of trying behaviors on her part, and not one that was ever formally addressed. I never said or did anything in her presence that I would have objected to having recorded, but it was still extremely irritating. You never know who is doing this, legal or not in your jurisdiction, and the court of public opinion can try you with the advent of easy videosharing on social media even where it is illegal. Why would a patient be liable for a HIPAA violation? They are not covered by HIPAA. HIPAA governs how healthcare providers and entities manage health information, not how everyone in the world does.